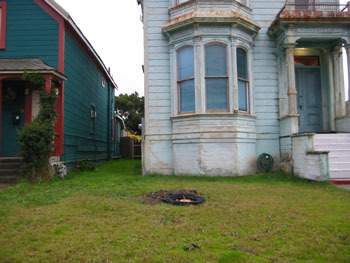 Note: this is a former static page that has been entered here. These events took place between September and December of 2003. Sure, Jon-Jon looks kind of sad right now, and smallish, too, but one day it will be a lovely addition. After doing nothing with the two front rooms for almost a year, we got our butts in gear and started finishing them off this fall. On the to-do list: deal with the water infiltration issue, deal with possible future water infiltration issues, insulate, re-wire, drywall, and then rip up the awful industrial carpet and refinish the floors. 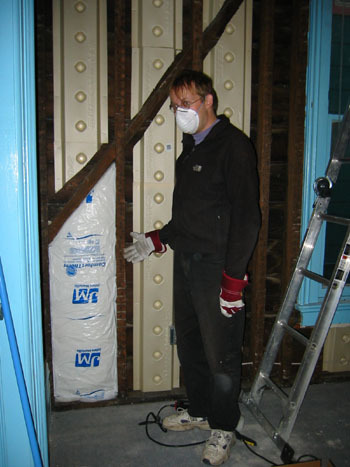 We dealt with the water infiltration by back-caulking the seams between the siding boards. This creates a dead air space where water can't be blown through the wall. Since the boards are designed to shed dripping water, this is all the protection we theoretically need. However, we're not going to open the walls every two years and check the caulk, so we also put in some measures to deal with future water infiltration. First measure: rafter venting. 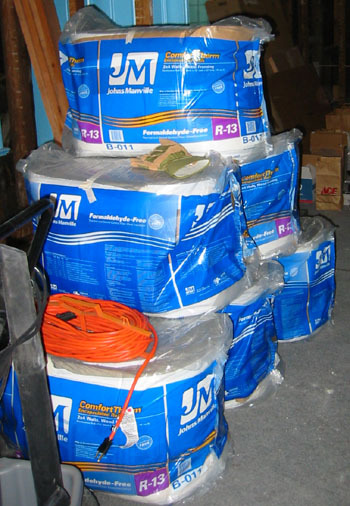 This stuff is used in attic spaces to maintain an air gap between insulation and the roof deck. It's a thin styrene foam channel board that gets stapled up and holds the insulation back an inch or so. We put this on the walls of the house so if water comes in, it has a place to drip, rather than get held against the wall by the insulation. 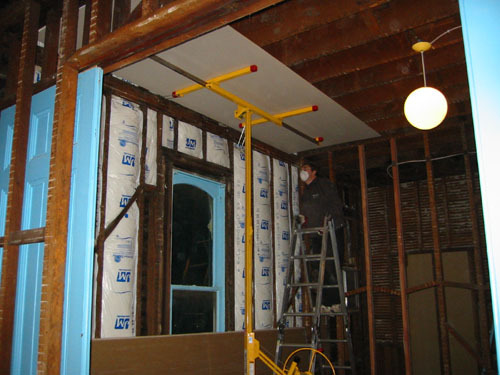 Second measure: encapsulated insulation. If the water does get in and through the venting (or in places where the venting doesn't fit), we don't want it getting into the insulation. 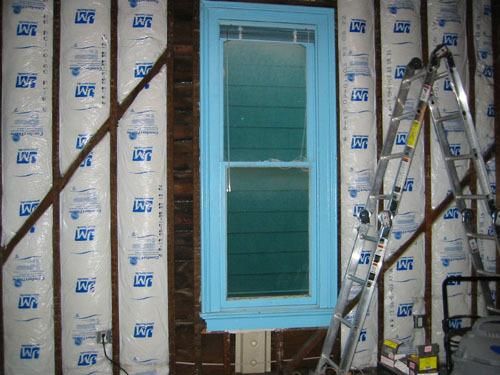 Insulation is really good at keeping air from moving, and damp air held against wood is Very Bad. 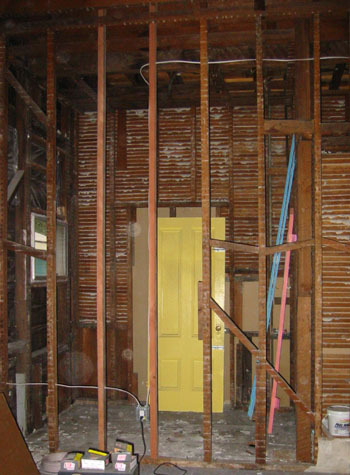 So by using encapsulated insulation, we can add another level of water protection.